Did you miss me yesterday? I didn’t get around to writing anything last night due to whiskey drinking with our gregarious host. We did have a rest day, did some washing (it is really great staying in a house rather than a hotel), bought some supplies. The Moose spent the day on the lounge recovering from a spot of bronchitis. 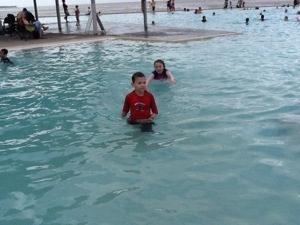 The other two went to Cairns’ really amazing public pool. Can you imagine such a thing in Sydney? An enormous, clean, free, UNFENCED public pool. With a beach on one side and a park on the other, right on the extremely unattractive waterfront, AND I was able to park the Merc right on the street in front of it. Anyway, today we were bound for the Outer Reef. Boarded the large and comfortable Sunlover, and about ten minutes out the vomiting started. First some little kids, then pretty much one hundred percent of the considerable contingent of Chinese tourists on board, also two of my kids and various others. Paper bags were produced in vast quantities, also cups of ice, and the staff broke out thousand packs of rubber gloves to collect the bags as they were filled and disinfect the areas in which the paper bags had been insufficient. It was impressively efficient, and the staff managed to keep smiling. I thought I’d break the monotony by visiting the bathroom, only to realise it was the seventh circle of hell, reserved for those undergoing complete physical breakdowns. I spent the rest of voyage with the Horror from Outer Space on my lap alternating snoozing with vomiting, watching the groaning Chinese man across the table alternating sweating and groaning with vomiting. Everyone felt a lot better once they were snorkelling, and once again I felt that it was magic. As the Muffet said, it really was exactly like being in Finding Nemo. I love the sensation of flying, especially over the edge of a bommie with a thirty metre drop to the bottom. We discovered that all of our children can actually talk under water. The trip home has been perfectly smooth, much to my relief, as we’re booked to go out again on a different boat on Monday, and the Moose looked like being scarred for life by seasickness and was a risk of faking his own death to avoid it. I can’t wait to go snorkelling again. 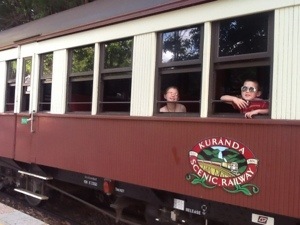 Ticking off the tourist delights of Far North Queensland saw us visiting Kuranda today. You can actually drive there, but if you’re a tourist you don’t do anything so mundane. You catch the cable car up to the town, stopping at intervals to wander around some rainforesty bits on boardwalks. When you’re in the town you proceed straight to the wildlife bits. For us the first stop was the butterfly sanctuary. Something I’ll bet you didn’t know about butterflies is that upon mating the female injects the male with a sedative as the whole thing takes fourteen hours and she doesn’t want him wandering off to watch the footy halfway through. She can actually fly away with him attached to her undercarriage if she feels threatened. You just don’t know how the other half lives until you go to these educational places. Actually it was all a bit jammed with sweaty human flesh for my liking, and the big Ulysses butterflies had an annoying habit of closing their vivid blue wings up when they stopped for long enough for you to photograph them. So we soon moved on to the bird sanctuary. This was more like it. It wasn’t one of those politically correct setups with birds in cages surrounded by their natural habitat so you can’t see them and you can only tell what’s in there by the interpretive sign at the front. These birds were swooping around, and as soon as we got in there my husband was pounced on by a large blue macaw. It perched on his shoulder and bent over his backpack to rather rapidly remove the screw top on our water bottle. It had clearly done this before, but I don’t know what it was planning to do next, as the kids rescued the water bottle before it could produce a straw from under its wing. Thwarted, it proceeded to tear the rivets out of his hat and made a play for his sunglasses and watch before moving on its next victim. The birds were all much happier to wander up and accept food from the kids than the obese kangaroos in the koala park next door. I was fascinated by a couple of things at lunch. One was the decorations of old stuff around the cafe, the only thing these pieces had in common was that they looked like they’d been dug out of someone’s backyard. 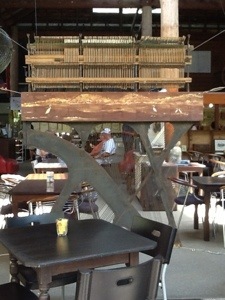 I was particularly fascinated by the guts of a grand piano hanging like a tapestry beside us. The other was a tarot reader. Picture to yourself an old, male hippy. That was him. Long grey hair, beard, scrawny, singlet with an Aboriginal picture of a turtle on it. Apparently tarot reading is something you need a lot of full body gestures to do well. If your kids have ever watched Stoked on ABC3, he was Kahuna. 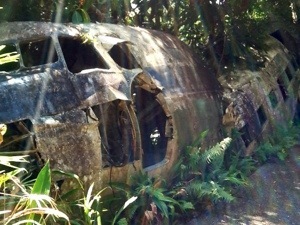 Coming out of lunch we couldn’t help notice a rather large plane wreckage right next to the koala park. They do seem to like random old stuff up here, the interpretive sign next to it pretty much said that’s exactly what it was. I should also mention an alarming stall we saw at the markets. It was basically fun things you can do to a dead kangaroo. Like cut a cute kangaroo shape out of its fur. Make its paws into backscratchers. You’d know already about the scrotum purse. But you don’t have a kangaroo fur bikini, do you? I can’t believe that it’s waterproof, and I can’t think of any occasion upon which you’d wear it. And a kangaroo fur hat would be too hot, while providing no sun protection. Odd. We took the scenic railway back, and while being fairly scenic, it certainly wasn’t the bullet train. I guess it did have to go around some fairly alarming curves. It was very ye olde and I kept expecting the witch to come around selling Bertie Botts Every Flavour beans. I think we’ve earned a rest day. I wonder what our host would like for dinner if I cooked? I might have to do a housewife blog tomorrow. Today was time for some proper touristing, so off we went to Green Island. It’s visible from Cairns, but not afflicted by the mud flats and killer jellyfish that make Cairns such an unattractive place to swim. Waiting for the boat I note with a great deal of satisfaction that it is now possible to get a decent coffee even at a tourist trap and I have high hopes for Australian culture. On the boat itself I crossed my fingers that my hairdresser doesn’t read my blog and decided that wind formed dreadlocks would be my low maintenance holiday hairdo. As it turns out, wind plus salt water gives me ringlets rather than dreadlocks, so other options are being explored. At Green Island we spent almost the entire time face down in the water. We have found an activity that the whole family loves. The coral around the island is pretty devastated, as you’d expect from such a highly touristed area, but there’s still a remarkable quantity of brightly colored fish to be spotted. I made the boys study the Fish of the Great Barrier Reef poster while we were waiting to get our snorkeling gear, and they were able to identify a wide range of improbably named fish. I think that the people making up the names get bored, I had to feel sorry for the rabbit faced fox fish. Or possibly the other way around. We had close encounters with turtles, a startlingly large stingray, and a bird that ran up the Muffet’s arm to steal a lunchtime chip. We saw many sea cucumbers, and they really do remind one of disembodied penises, though why that would make you want to slice them into your salad is beyond me. 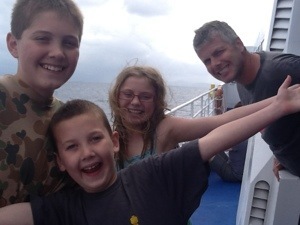 We were a little, how do you say, there must be a German word for it, somewhere between annoyed and delighted to see a whole lot of turtles and two reef sharks from the pier on our way back to the boat. I have high hopes for our trip to the outer reef later in the week. One didn’t take one’s iPad snorkeling, so you’ll have to put up with a photo of our dinner. 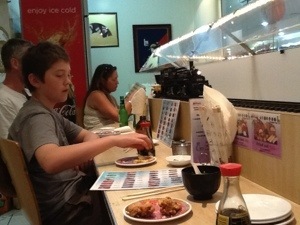 It’s a sushi train – on a train! Sound effects and everything, I loved it. I have to send my father this shot, he doesn’t read blogs. For some reason, an interest in model trains is mutually exclusive to an interest in the digital expression of modern thought. I knew you’d just be hanging on the edge of your seats wanting to know how I’m getting on in Cairns. Also, this blogging thing is habit forming. You’ll recall that I was in some discomfort because my husband’s friend, instead of recommending a motel in Cairns to us, insisted on lending us her house and car. It later on transpired that the deal included her husband. My discomfort increased today when the husband, let’s call him Gary, turned up to pick us up in a shiny Mercedes closely followed by his friend Glen in a Jag. Apparently the four wheel drive immaculate Merc is what we’ll be driving this week. As it turns out, Gary was really very pleased to have us, he was feeling a bit lonely without his wife and daughter, and actually turned up the volume when the kids were playing Guitar Hero on the Wii. He dragged in his neighbour who happens to be a travel agent and we planned our week on his couch, with special mates rates. Then Glen popped by accompanied again by the Jag and a tiny baby poodle whom the Muffet is determined to smuggle back home. I should mention that Glen is a wisecracking Chinese guy who wears sunglasses at night, and I’m guessing he’s around sixty. He was teasing the Muffet, telling her the dog was going in the soup at the restaurant. We then all went out to Gary’s Malaysian restaurant, and now I won’t have to eat again ever. The night was a little marred for Muffet when they hauled a live lobster out of the tank and brought it to the table about five minutes later done in ginger and shallots, but gosh it was good. The Moose got to practice his Japanese on Glen’s twenty year old Japanese girlfriend who apparently is a Fukushima refugee. Then we watched as the guys running the Indian grocer next door to the restaurant emptied their shop into a series of station wagons, apparently with the intention of doing a bunk on the rent. I had to take the Horror home, as he fell asleep under the table, leaving the husband with Gary, Glen and the Muffet and a flowing bottle of red wine, so who knows if I’ll be seeing them again any time soon. It won’t be so bad, staying in a house, even if I do have to put up with a One Direction and a Taylor Lautner poster for the week. Not your traditional account of Cairns, but I’ll get more orthodox as the week progresses, I’m sure. When the weather gets warmer I start thinking about making fruitcake. Cut that out, mine’s really nice, not sticky or cloyingly sweet, and it doesn’t have nuts or brandy in it. I’ve made converts out of non fruitcake eaters. Alas, not my children, when they see me making a fruitcake they say “great, why can’t you make a cake that we actually like?”. I’ll keep making them eat it and in five or six years they’ll start to see it my way. Parenting is about patience. I was going to wait until after the school holidays for the first step in my fruitcake, but serendipity stepped in. The first step is to make your own mixed peel, because the stuff you buy is dull dull dull. I make mine with grapefruit and orange peel, although today there’s a lemon in there too because I’m running the pantry down before we go away. My daughter and her friend walked the dogs around the block (a fairly rare occurrence, and the dogs are still lying on the floor recovering) and found bags of grapefruit on a front fence around the corner with a sign on them saying “free to a good home”, or something of that nature. Clearly a sign for me to make mixed peel. It’s really easy. Bung it in a saucepan and cover it with water. Bring the lot to the boil and boil for about five minutes, or for about the time it takes to check Facebook and empty the dishwasher. Strain, discarding the water, and do it again. Strain again, and return just the peel to the saucepan with two cups of water and one cup of caster sugar. Simmer over low heat, stirring occasionally, until the peel is translucent. I can’t remember how long this is, because I haven’t done it since last year, but a good twenty minutes or so. 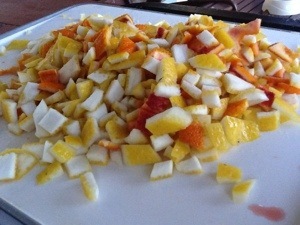 I then drain it and put the sticky mess of peel in Tupperware and into the fridge. It makes enough for about two fruitcakes. I reserve the syrup in a separate container, intending to use it something else, but I generally end up throwing it out after a couple of months. I clearly need to make more cocktails. You’ll get the actual fruitcake recipe some other time, but I’m off on holidays. It may be that I find our travels to be sufficiently amusing to document, it may not. I may not be able to wrestle the iPad from my husband during our moments of leisure. So don’t hold your breath, and I’ll be back muttering again in a couple of weeks. My sister says that most people who blog have some kind of mental illness. Do you think social awkwardness counts? We have a situation that is causing me much discomfort, and I’m trying to assuage that discomfort by making a necklace, but I guess it all depends on your perspective. We’re going up the coast next week, and my husband knows a lady who quit finance to live by this particular beach and run a Malaysian restaurant with her husband. My husband asked her for a motel recommendation in her town, and she responded by saying that her family was popping back to Malaysia for a bit and we were welcome to use her house and car. That’s very nice and everything, but it turns out that she is actually leaving her husband behind to run the restaurant, and he is included with the house. He has also been instructed to pick us up from the airport, and she’s not taking no for an answer. Doesn’t that sound like a situation? I’m of shy and retiring disposition, I three fairly loud children, and I’m going to be staying in a house with a restaurant running man who’s English isn’t terribly fluent and the few times I’ve met him he has been enthusiastically engaged with a karaoke machine. 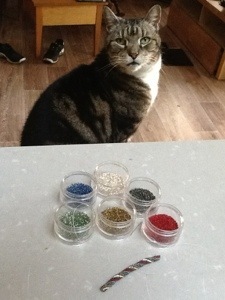 The very least I can do is to make the lady of the house a necklace. That’s what I do in times of stress. I know I should actually be making something for the husband, as he’s the one having to put up with us, but that’s not where my talents lie and where would I even start? I should have begun this weeks ago. It’s a herringbone spiral rope made with size eleven seed beads, stitched one at a time. That length is how much I’ve managed to do today, in between doing the choir banking, taking the piccolo for a grease and oil change, treating the dog’s ears for a fungal infection, buying milk, picking up the kids from school, and starting another necklace for my daughter to wear to a wedding we’ll be attending. I’m sure I can finish it by Sunday night. Back in the early days of our marriage we would have an annual conversation. It was very short, and it went like this. “Shall we start a family this year, or travel somewhere exotic?”. It’s amazing we ever had children at all, really. One year we went trekking in Nepal. Nepal, as you would know or imagine, is a very different country to Australia, but the first thing that strikes you is that it’s almost completely vertical. Coming from a wide brown land, this is a bit of a shock, because it means that to get anywhere you need to go up stairs, often for hours at a time. I had hoped that all those stairs would have a slimming effect on my rather large calves, but no, they just got very ropy. Camp was made every night on small patches of grass bordered by a cliff face on one side and a sheer drop on the other by unfailingly cheerful porters. After making camp they would immediately set up tiny camp stoves and produce delicious meals of vegetables and lentils and rice, and sometimes a chicken that had been seeing the sights from a basket on the cook’s back. All a little lost on me, it was in Nepal I discovered that I don’t really digest lentils. Breakfast was often a hot porridge, and after tasting it I couldn’t believe we don’t do it this way here. I made some this morning. I’m putting in a photo of the uncooked ingredients, because after it’s cooked, it looks a lot like porridge which makes for a rather uninteresting photo. Chop up a small green apple and put it in a small saucepan. Add a quarter of a cup of chopped hazelnuts and a quarter of a cup of flaked coconut, two cups of oats and two cups of water. As it happens, I got everything except the water from Honest to Goodness, they have a stall at the Orange Grove Markets. Put on the stove and stir until the water is absorbed. It makes enough for two, or one really hungry person. 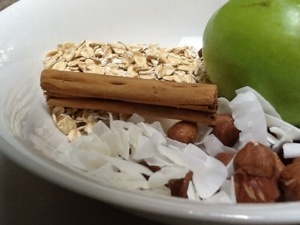 I sprinkled it with cinnamon sugar, but you could put a cinnamon stick in while cooking. It was a little spartan, you may want to add sultanas, which would start bringing into Bircher Muesli territory, but it’s all breakfast. My husband said he prefers it plain. My family is a tough audience. Tonight is one of those nights when the man of the house is out. This means the rest of us kick off our shoes and don’t put them away and eat in front of the TV, sometimes without using utensils. Something I started making for the kids when they were very little is corn fritters, and they still often want them on a Tuesday night. It’s really just a savory pikelet, and if that’s enough information for you then feel free to move in with the rest of your day. If not, here’s how it’s done. If you’re not living somewhere where it’s springtime, get yourself a 410 gram tin of corn. It always seemed like an odd measurement to me, I presume it has been converted from bushels at some point. If you have access to the spring glut of fresh corn, get yourself a few cobs and start slicing the kernels off. This isn’t a job I enjoy, as they bounce everywhere, but I guess that means the dogs get some fibre in their diet. Two or three cobs should do, it’s a very rough recipe. 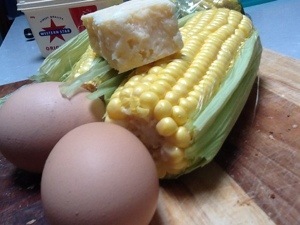 Transfer the corn to a bowl and mix in two eggs. Also some grated parmesan cheese, I always have some left over from a previous night’s pasta, so anything from a quarter to a half a cup can go in. I don’t let the Moose see, as he has this odd belief that he doesn’t like melted cheese. He’s wrong, of course, everyone likes melted cheese. Then you stir in a cup of plain flour and two teaspoons of baking powder. Then as much milk as will make a thick batter. Don’t ask me how much that is, you should be able to stir it pretty easily, but it shouldn’t be runny. You can do that much a couple of hours ahead of time, for instance before picking up the kids from school. At eating them time, heat up a frying pan over moderate heat and melt some butter in it. I think butter makes it crispier than oil. Start hoiking in soup spoons of batter. When bubbles start appearing on top, turn them over. You’ll need more butter for every pan full. Repeat until all batter is gone, at which point you turn to the plate you’ve been putting them on to find it empty. It doesn’t really make enough to feed three growing children, so you should also plan to find some leftover fried rice in the freezer to fill up the corners. Or cook them some cobs of corn, it’s really cheap at the moment. You can never get too much corn, just ask any American. At some point in every housewife’s life she gets the urge to make her own bread. This sets her off on a lifetime’s journey in quest of the perfect loaf which I shall occasionally chronicle here. My journey began with a bread maker. We may have got it as a wedding present, I can’t remember, but at some point early in our married life we acquired a bread maker. It’s a pretty simple machine. There’s a rectangular bucket at the bottom of which is a paddle that does all the hard work. You fill this up with the ingredients, insert the bucket into the machine, set it going and in the morning you have hot fresh bread. The very first morning the hot fresh bread slides easily out of the bucket and off the paddle, but never again. There are many problems with making bread this way. I never like the shape of the loaf, the cross section was too large, the crust was too chewy. The loaf in itself was OK, especially if you’d added all the ingredients. I used to put it on last thing at night, and because it only had very few ingredients I’d do it from memory which meant that we’d sometimes end up with a bucket of well mixed ingredients that hadn’t turned into bread. You had to make sure that the paddle was inserted correctly and the bucket was locked into the machine, otherwise sludge would ensue. The machine was quite noisy, so I had it on the back verandah, not a desirable location first thing in the morning in the winter months. What finally made me give it up was the paddle. It was always firmly embedded in the end of the bread. So you’d eat your way to the end of the loaf, then push the paddle out and wash it for the next loaf. Or alternatively, get to the end of the loaf and throw it in the bin. If this happened on bin night, it meant a trip to the creepy appliance shop up the road which was always inexplicably stacked to the roof with toasters. How could anyone hope to sell that many toasters? But they were always happy to get me in a new bread maker paddle. The last time this happened I gave up. It was time for me to start making my own bread by hand, the next step on the Bread Journey. Anyone who makes bread ends up turning it into a journey, try it yourself and see if you can stop with the first method you try. What prompted me to dig up this story from the vault is something that the dogs dug out of the compost bin today while searching for a rat. The last of the bread maker paddles. 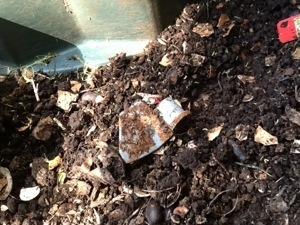 Another excellent reason to compost.